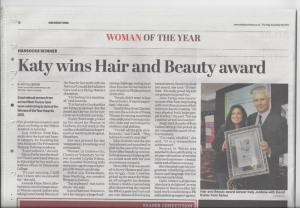 On Friday 22nd of November 2013, Founder & Head Trainer of the Permanent Makeup Training Academy, Katy Jobbins, was crowned the ‘Woman of the Year’ for the Hair & Beauty Industry, by Former Olympic Champion & OBE Sally Gunnell. 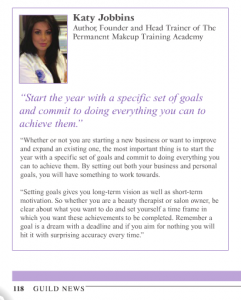 This award truly recognised the hard work and effort she had put in to helping her students set up and succeed in the permanent makeup & beauty industry. Coupled with the ongoing support and aftercare she gives each and every one (as well as her own personal clients), led the judges to have no choice but to crown her the outright winner. Looking back 2013 was a very successful year and so far in the first half of 2014 business has gone through the roof. 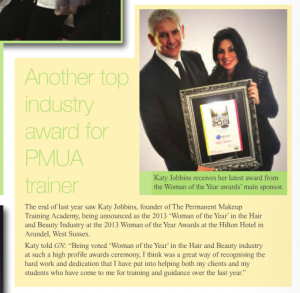 It’s a great feeling to be recognised, but its even more rewarding to see the successes of the students that Katy has trained, a sample of which can be seen on the website. Katy continues to contribute articles to both the Guild News and Salon Today as well as being on ‘Ask the Expert Panel’ for Salon Today. 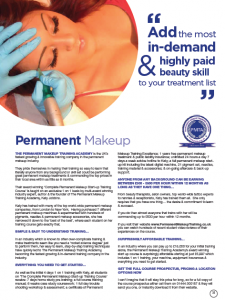 If you are currently researching and considering training in Permanent Makeup then it pays to know who you will be training with and how successful they are, as it will reflect in the knowledge and quality of the training that you will receive.